Thanks to those of you who came along to the Heineken on Campus event. There was a brilliant turn out and we’d like to thank Heineken for coming along to give students an insight into the brewing industry! This week we have some exciting news. We’ve made Non Linear Regression and Maillot Blanc (Saison) available in can form! You can pick these up from CentrAle in Newcastle Central Station, Coppers at Gosforth or by messaging Harry and Lucy at sales@stubrew.com. We’ve also had the privilege of brewing a Berliner Weisse in collaboration with Rob from Two by Two Brewing. Keep an eye out for our latest collab brew which should be ready in the next two weeks! On Tuesday Harry, Tom and Carey had a great night at the PwC Opportunity Challenge Quiz at Tyneside Cinema. It was a great opportunity to meet other societies from Newcastle University and Northumbria University. Speaking of pub quizzes, we’ve got a great event lined up next week. 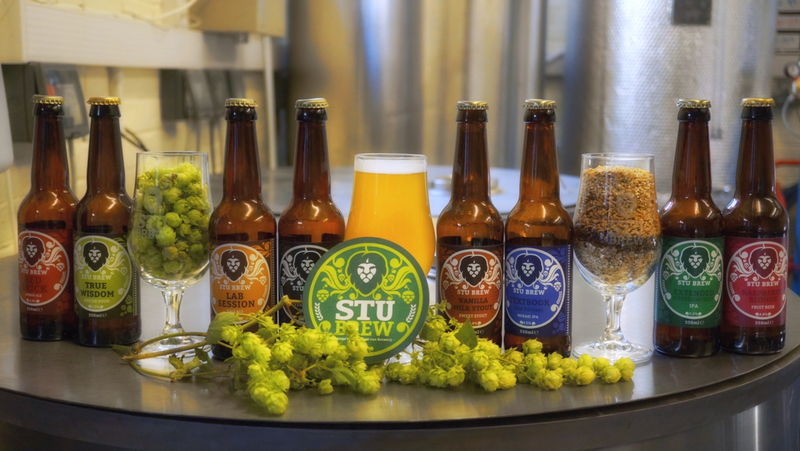 We love quizzing here at Stu Brew and we’ve organised a pub quiz at Errant Brewery. You don’t need to be a member to attend and you can find out more details by checking out our facebook event. We’ve had a delivery of some merchandise! Just in time for Christmas and the colder weather, we’ve received a first batch of some beanies with our own lovely lion on the logo. Carey and Liam could not WAIT to show you these. To pick these up you can pop along to the Student’s Union Shop. These would make a great Christmas present or simply a great addition to your A/W 2018 winter wardrobe. ← Weekly Blog 17 26/11/2018: What’s brewing?